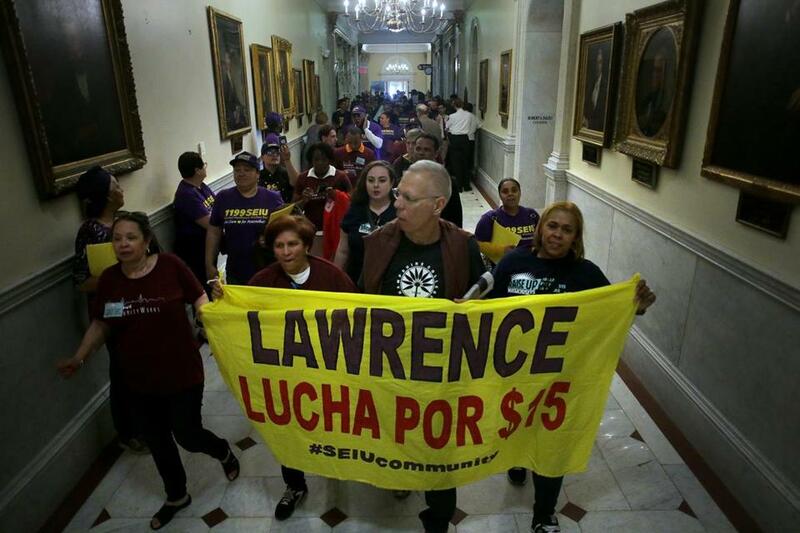 Demonstrators from the Raise Up Massachusetts coalition marched through the halls of the State House in May to rally for paid leave and a $15 minimum wage. 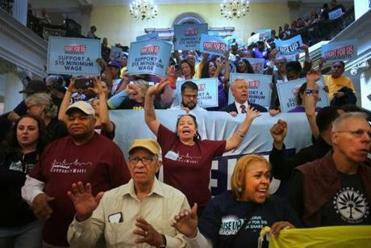 Aiming to boost wages and benefits for millions of Massachusetts workers and defuse an explosive political showdown over three ballot questions, the Legislature on Wednesday enacted a compromise to raise the minimum wage, ensure paid medical and family leave, and eliminate premium pay for Sunday workers. With speed rarely seen on Beacon Hill, the House and Senate passed the bill by wide margins, cheering what lawmakers called a nation-leading package of employee perks: the most generous paid-leave program, and, with California and New York, the nation’s highest state minimum wage, $15 per hour, in the coming years. But it remained unclear if the so-called grand bargain bill would keep all three ballot questions — hiking the minimum wage, mandating paid leave, and slicing the sales tax from 6.25 percent to 5 percent — from being put to voters in November. Governor Charlie Baker did not say whether he will sign the measure that was sent to his desk. And while a key business group vowed to stand down on its sales tax question if the bill becomes law, there was uncertainty on another initiative. Raise Up Massachusetts, a coalition of labor, faith, and community groups, left open the prospect it would still bring its minimum wage question — which would mandate a $15 minimum wage sooner and require a higher cash wage floor for tipped employees than the compromise — to the voters in November. The compromise passed the House 126 to 25 and the Senate, 30 to 8 and was lauded by top officials, who had fretted that the proposed decrease in the sales tax would deny the state more than a billion dollars in annual revenue and create abudget crisis. The legislation would incrementally raise the hourly minimum wage from the current rate of $11 to $15 by 2023. At the same time, it would phase out mandatory time-and-a-half pay on Sundays and holidays. It would also raise the minimum cash wage that must be paid to tipped employees from the current $3.75 to $6.75 by 2023. The bill would create a paid family and medical leave program that would allow almost all employees to take up to 12 weeks of family leave and up to 20 weeks of medical leave — with a guarantee that they would be restored to their same or equivalent positions, with the same status, pay, and employment benefits. That program would be funded through a 0.63 percent payroll tax that would, on average, add up to between $4 and $4.50 weekly per employee, said Senator Jason M. Lewis, who helped craft the bill. That cost would be split roughly 50-50 between employee and employer. Workers would see a diminution in their take-home pay starting next summer, with the leave benefits available to them starting in 2021. And while the Legislature has created a sales tax holiday weekend intermittently in recent years — during which people can buy most goods without paying the state’s 6.25 percent levy — the bill would establish a permanent one every August. Legislative leaders made the text of the bill public just hours before voting began Wednesday and rocketed it through without either chamber accepting any substantive amendments. That strategy was seen as a successful attempt to outrun opposition from some unions that balked at eliminating time-and-a-half pay on Sundays and holidays. “The leadership tells all the members, ‘We don’t want you to put amendments in; we don’t want you to speak.’ This is a public building. A legislator is supposed to debate,” said Steven A. Tolman, president of the Massachusetts AFL-CIO and a former state senator. He also pointed to Monday’s Supreme Judicial Court decision rejecting a ballot question that would have imposed a higher income-tax rate for personal earnings above $1 million and funneled the money to education and transportation. “The Legislature takes away overtime of hard-working middle-class people, without any debate or very little debate, and then they call it a grand bargain?” Tolman said. There was another reason for the rush: For the bargain to keep the questions off the ballot and work as many lawmakers hoped, Baker would need to sign it into law before the July 3 deadline for final submission of signatures. Baker said it was “good news” that advocates, businesses, and lawmakers have gotten to this point. “Based on what I’ve heard so far, it certainly fits the contours of what I thought a grand bargain on this stuff would look like,” he said. Business leaders issued a tepid response to the bill’s passage. “Although imperfect, this legislation reflects compromise from all sides, and we accept it,” said James E. Rooney, president and chief executive of the Greater Boston Chamber of Commerce. Hurst said that if Baker signs the bill, his group won’t go to the ballot. And Raise Up Massachusetts said it would not take the question on paid leave to the ballot if Baker signs the legislation. The group remained noncommittal about the minimum-wage effort. Matt Rocheleau of the Globe staff contributed to this report. Joshua Miller can be reached at joshua.miller@globe.com, Matt Stout at matt.stout@globe.com.